a rain jacket), since they make all the difference between an enjoyable outing and a miserable one. Funny thing is, most rain pants only come in ONE LENGTH per size. That means size S has a “choice” of one inseam only, size M has one inseam only, and so on… That's why you may end up with crunched-up pant legs, like on the picture above. All these manufacturers seem to blithely ignore the fact that people’s legs come in vastly different lengths. They seem to think that if you don’t have their “standard-length” leg, that’s your problem… Amazing! 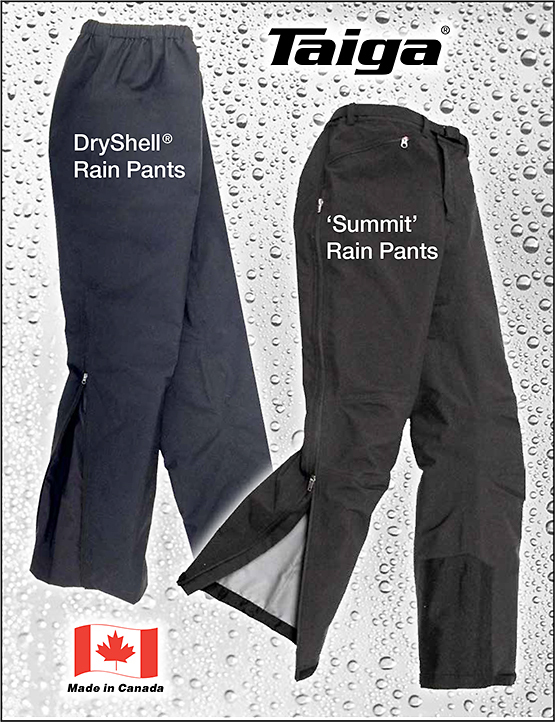 IMAGINE… Rain Pants that actually FIT! 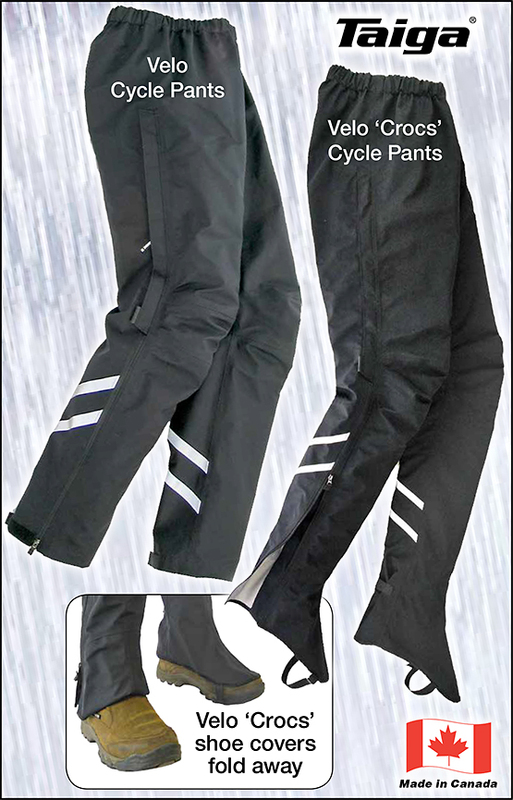 All Taiga® Rain Pants (6 different styles) come in 2, 3, or even 4 inseams per size. That means these pants fit so well, you can wear them on the street without getting funny looks from passers-by. What’s more, design & quality are the typical, unrivaled high standard of Taiga® products. 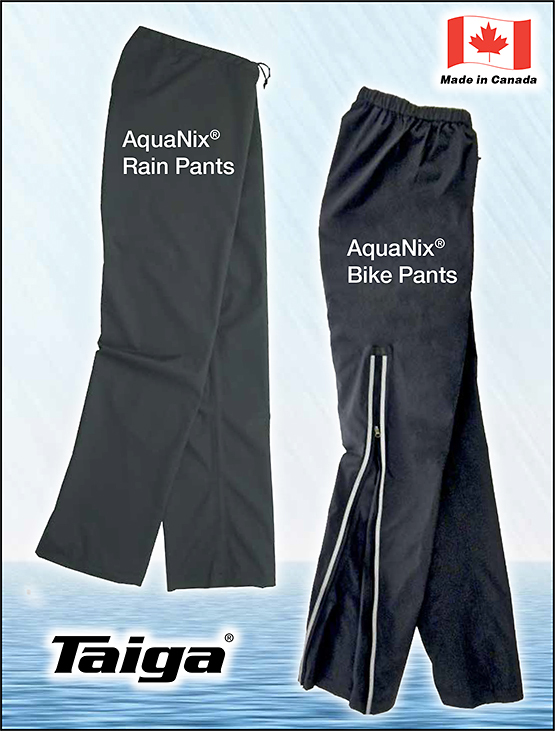 All pants shown below are made with waterproof/breathable, fully seamsealed 2.5-layer AquaNix® or 3-layer DryShell® fabric. And our friendly manufacturer-direct prices don’t insult your sense of financial fairness… Compared to the prices at megastore competitor MEC®, our prices appear to be quite friendly indeed. Zippered fly, waist belt, zip pocket. waist & drawstring. Reflective strips. 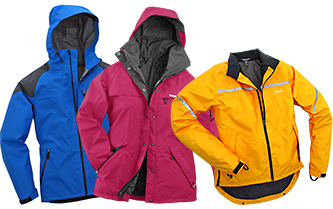 waterproof/breathable Jackets & Pants, all made in Vancouver, Canada.